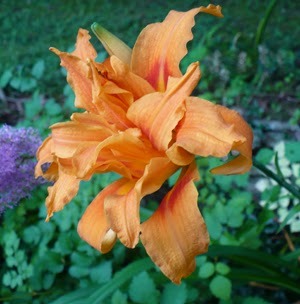 This beautiful double petaled day lily from my garden will make a nice subject for a demonstration of a botanical painting. Since botanicals are done from the live plant, I have cut one and brought it inside. Come along and I'll show you how I paint it. I'll paint it to size 7" x 5". After drawing each petal, stamen, bud and leaf, I look closely at the subject to see what the base color is beneath all the other colors. In this case, for the most part it is yellow. 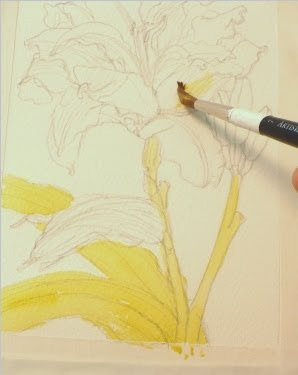 So I use a transparent lemon yellow wash over almost all of the flower and leaves. 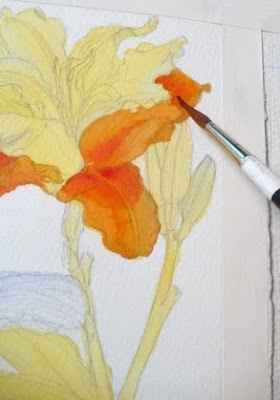 Since watercolors are transparent, this yellow will give a warm glow to the colors painted over it. The one exception is the spent flower as it is losing its color and is a cooler shade, so as you will see below, I paint that pale blue. SECOND STEP: After painting a base of yellow and blue, I blend some blue into the wet yellow paint wherever there are shadows. You can see it if you look closely. 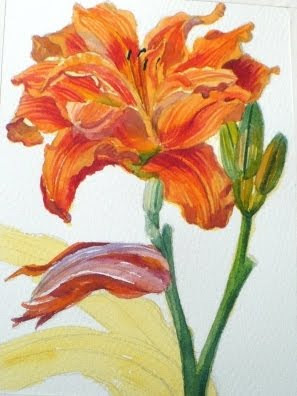 Next, I begin painting the flower petals shades of orange. I mix the orange color from warm yellow and rose red paint. Mixing the color gives me the ability to make variations of yellow-orange and red-orange. It is easier to do this by mixing two colors than if I'd used orange paint. Shadows are made by adding deeper rose color to the mix and also by adding blue to cool the color down. In this painting, the sunlit parts are warmer and the shadows are cooler. Since blue is a cool color, it makes sense to use it in the shadows. 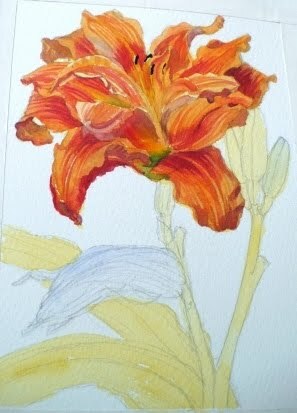 Then I add line detail with a darker orange mix to show the veins in the petals and very dark brown to show the tips of the stamens. Now the flower is complete. FOURTH STEP: The stems and buds are next. For the stems I use green which I've mixed with blue on the shadow side. The spent flower is done with dark orange and deep blue. You can see how it is not as bright as the flower above it since it had a base color of blue rather than yellow. LAST STEP: All that is left is the leaves. I use the same green that was used for the stems, leaving highlights to give them shape. Then I paint some veins on them but don't get too detailed with this. I want the attention to be on the flower. Now it's finished! I am happy with how this painting has turned out. So all that is left is to write the botanical name and sign the painting. Since there is not enough space at the bottom, I write this along the right hand edge. I hope you enjoyed this demonstration. 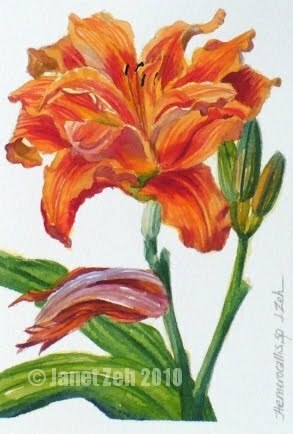 You can get my botanical prints at Prints.ZehOriginalArt.com in the botanical section. Have a lovely day! You are very welcome. So glad you enjoyed it!